The usual 2 oven Aga has only 23 bolts and nuts to undo and it's then in bits. Yes the bits are heavy but nothing that 2 people can not lift! This e-book will tell you all you need to know. Rebuilding involves getting levels correct - if you can't use a level forget it BUT if you tackle jobs like wall building, car mechanics you should have no difficulty! Save a Fortune, not employing an expert! How to take to pieces without damage to it or yourself! Cookers Not to buy, recognition pictures! Solid fuel- oil-gas-lpg models covered from 1941-now! All models covered except electric! Ways to save your back- and BREAKING the Aga! What to do to stop cast iron RUSTING! Useful contact details for spares! Removing an Aga can easily cost you £600 if an expert is employed. Yet for the cost of a Transit and a helper, plus tools most diy’ers have you can do it yourself! This e-book will tell you all you need to know. Simply pay the single fee of £9.95 via our checkout process and the e-book will be available for immediate download. Once in your computer you may print it off as required. PDF file used - download the free Adobe Reader by following the link below. Re-assemble instructions are NOT covered in this e book – that’s in the rebuild version also for sale in this store! Electric Agas NOT covered - but I know a man who does these. Additional Note! 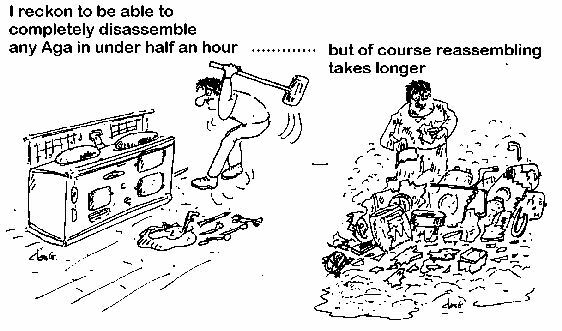 You should make sure that your OIL or GAS engineer is happy to "sign off" your cooker BEFORE you rebuild it, as its THEIR responsibility if its not right. For this reason talk to them first. Not sure what an e-book is. Which download option to choose. Need to know how to download your e-book. Please click here for our FAQ page which has answers to these and many more questions. Simply complete our checkout process and your e-book will be available for immediate download. If you don't have Adobe Reader installed on your PC simply follow the free download link below.